Lightest H.E. bomb SC 50 (50kg) 43.3"L x 8”Dia. 21.25kg filling. In between there was the SD 50, SC 250, SC 500, SC 1000 and SC1400. (The Lufwaffe also used SC2000 and SC2500 but none of these types were dropped that night). 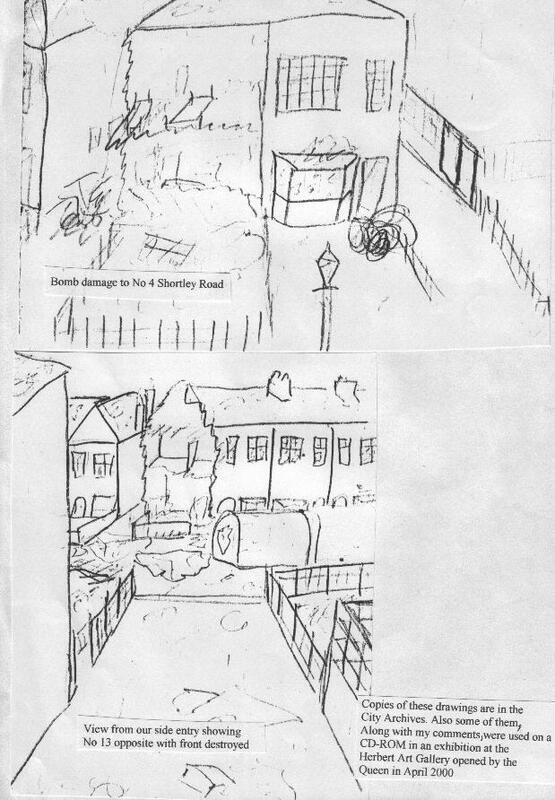 Sketch showing Coventry Blitz bomb damage. The majority of the H.E. bombs dropped that night were of the SC50 and SD50 types. The 1kg Incendiary bomb. Types B1E1 and B1E1ZA. 14”L x 2”Dia. The incendiaries were dropped in canisters containing 36 bombs which opened at pre-determined heights. Some of the canisters were opened by an explosive charge and some were opened by clockwork. Some of these bombs (B1E1ZA) were of the explosive type which had a small charge attached to the filling boss underneath the tail fin. The charge normally went off about 2 minutes after the bomb ignited but not many of this type of bomb were used during this raid. Flam C250 and Flam C500. The Flam C250 contained 50kgs of an inflammable oil mixture and a 1.25kg explosive charge but their use was discontinued after December 1940 because many failed to explode. Flares and flash bombs were also used. Parachute Flares were normally used to illuminate the target prior to bombing but were possibly not used on November 14th because the aircraft bombed on the Knickebein Directional Beam. It was also a perfect moonlight night. The last bombs to drop were at Whitley when a stick of about a dozen 100lb (SC 50) fell at 5-30 a.m in Shortley Road, causing a lot of structural damage to houses, but only a few injuries. Coventry, German codename Korn, was target No.53. Three types of enemy bombers were used. The Heinkel 111, The Dornier 17 and the Junkers 88. The He111 carried a bomb load of 4,410kg, the Do17 a maximum of 2,205 kg and the Ju88 4,420 kg. They were all medium bombers. The Ju88 was the latest to come into service whereas the He111 and the Do 17 were almost obsolete. The Do17 had originally been a transport plane. 449 planes were used in the attack, although another source quotes 363 only. Two Luftwaffe Groups were engaged - Luftflotte 2 and Luftflotte 3. Luftflotte 3 records stated that they dispatched 342 aircraft and 304 arrived over the target area. The records for Luftflotte 2 were never found and were presumed to be destroyed so an accurate figure of the aircraft engaged could not be confirmed. The tonnage of the bombs dropped by Luftflotte 3 is known and the estimated total tonnage suggests that the figure of 363 aircraft engaged would be more accurate. Luftflotte 2 was based on airfields in north east France and the Low Countries and Luftflotte 3 were on airfields in north west France. Pathfinder unit Kgr100 were based at Meucon, near Vannes on the Brittany coast off the Bay of Biscay. The Pathfinder group, comprising 13 He111s, crossed the coast at Lyme Bay at 18-17hrs and between 19-20 and 20-05 dropped 10,224 incendiary bombs (half of which were the explosive type) and 48 SC50 100lb high explosive bombs. They observed 8 large and many smaller fires. 15 minutes later,16 He111s dropped, from 20-20 to 20-55hrs, 5 SC1800, 11 SC1400, 5 SC500, 32 SC50 and 32 SD50 high explosive bombs and 2,412 incendiaries. From then on at 10 to 15 minute intervals, batches of about 20 aircraft bombed the target area. The bombs were released from between 10,000 and 20,000 feet. Some of the planes crossed the Lincoln and Norfolk coasts while others crossed between Selsy Bill and Portland and between Selsy Bill and Dungeness. The total bombs dropped by Luftflotte 3 comprised of:- 23,848 B1EL incendiary bombs 5,112 B1EL ZA " " (Exploding) 28 Liquid " " 8 Flam500 oil bombs 20 Flam250 and 326 ton of high explosive comprised of:- 8 SC1800 11 SC1400 26 SC1000 78 SC500 (including 3 UXB) 369 SC250 ( " 17 " ) 1,034 SD50 (fragmentation bombs) 1,272 SC50 (including 50 fitted with "Screamers" attached to the fins. A Luftflotte 3 JU88 dropped a mixture of bombs at 05-10hrs and they were the last recorded bombs to fall by that Group. Therefore it is safe to assume the bombs that fell at 05-30 must have been dropped by an aircraft from Luftflotte 2. There were 35 specific targets including all the major manufacturing plants and gas and water supplies. Some of the targets were small. 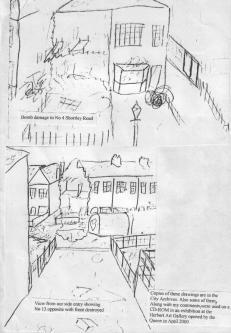 For example Cornercroft in Queen Victoria Road. That building later became the retail fish market. It wasn’t hit. It was estimated that altogether 500 tons of bombs fell on the city that night. On 23rd November the Police stated there had been 417 UXBs and 18 unexploded Landmines reported, many of which would possibly later be discounted. Get ready to impress your friends with your knowledge – not just of the main events of World War Two, but of all the gritty details and weird true facts. By the time you finish this book, you’ll have a fact for every occasion, from the first moment someone thought about having a second World War, to the most recent blockbuster movies about it. So get ready to meet characters from Adolf Hitler, rejected art student, to Jack Churchill, the broadsword-swinging male model. Find out why World War Two started in the first place, and why it’s never a good idea to invade Russia in winter. Learn why the United States was going to stay out of the war, how Canadians stole airplanes for the British, and what an orange soft drink has to do with the Nazis.